History of India can be divided into 3 sections – Ancient, Medieval and Modern. A significant weightage has been given to History over the years. As per the recent trend, atleast 15-20% weightage is given to History. But then History is a very ‘vast’ subject. So what to do now? A plethora of questions keep bombarding your head – How do I read History? What to focus on? Will I be able to cover the entire syllabus? The answer to all your confusion is here – You have to think smart! 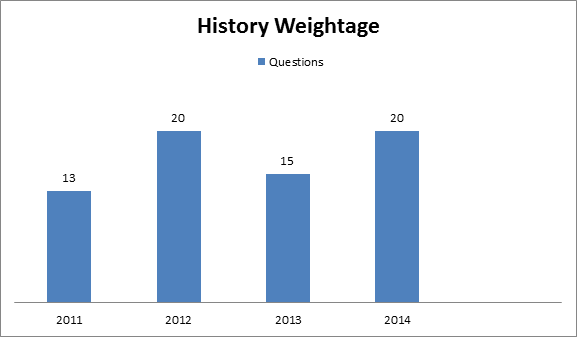 From the previous year papers analysis, we have observed that more weightage is given to ‘Modern History’. So to make the maximum benefit for the time invested, ‘prioritize’ in this order- Modern, Ancient and Medieval History. In this article, to ease your preparation we have divided History into 4 Sections – Modern, Ancient, Medieval and Culture. Under each section we have analysed the weightage given, what aspects to focus on and the books to refer. So now let’s start with Modern History. Emergence of regional powers in the early decades of 18th Century is taken as a change from the Medieval to Modern India. The early modern India witnessed the fall of the great Mughal Empire, the Marathas and Consolidation of British rule in India. The mid-phase marks the struggle of Indians- revolt of 1857 (or the First War of Independence), organisation of Indian National Congress, role of Moderates and the Extremists. And finally the last stage stands testimony to various National Movements –Civil Disobedience Movements, Quit India Movement, Formation of Constitution Assembly and Sampoorna Swaraj (or Complete Independence) to India. Modern India is the most important section from the prelims perspective. The weightage given to this section over the years stands testimony to the significance of this section. How to read Modern History? In this section, we come across various revolts/movements/agitations (like 1857 revolt, Tebhaga Peasant Movement, Home Rule Movement, Quit India Movement). Note: Also note down the ‘chronology’ of the major Movements and Missions sent by the British to gain support of the Indians and extend their rule. Type of Administration followed during The Mughal’s rule. Example: Mansabdari System, Jagirdhari – its significance and impact. The British rule. Example: Subsidiary alliance, Permanent Settlement, Mahalwari system etc. – its significance and impact. Consolidation of the British rule in India– through enactment of various Acts/Laws (Regulation Act, 1773 to Indian Independence Act, 1947). Atleast two to three important changes/provisions made under each Act and the Governor Generals involved should be noted down. And also the impact of the Act should be given importance. Example: Under Charter Act, 1833- The East Indian Company’s monopoly over tea and China was ended. Lord William Bentinck was the Governor General then and he was instrumental in abolition of ‘sati’ system. Political-Administrative organization, Policies of the British India. Note: Give special importance to Events, Movements (including Tribal, Peasant and Trade Union Movements) and Acts passed after Revolt of 1857. The tendency for increased litigation was visible after the introduction of the land settlement system of Lord Cornwallis in 1793. The reason for this is normally traced to which of the following provisions? What was/were the object/objects of Queen Victoria’s Proclamation (1858)? This is another important section of Indian National Movement from the Prelims point of view. Reform Movements like Brahmo Samaj, Arya Samaj, Theosophical Society, Harijan Movement etc. how these movements were important in building a sense of nationalism among Indians. Social reforms that had an impact on Education, Status of Women, Caste system of the society. Which of the following statements is/are correct regarding BrahmoSamaj? 3. stressed the need for eradication of all the social evils before anything elseWhich of the statements given above is/are correct?